When brainstorming photography ideas for this project, I thought back to the kind of child I was and what I found fun and interesting. Too often, adults forget about what lives above their heads and next to their feet. Whether it’s looking up to enjoy the clouds and blue sky or lying on grass and observing the world from an ant’s perspective, moments like these give us a much broader and whole picture of what life encompasses. 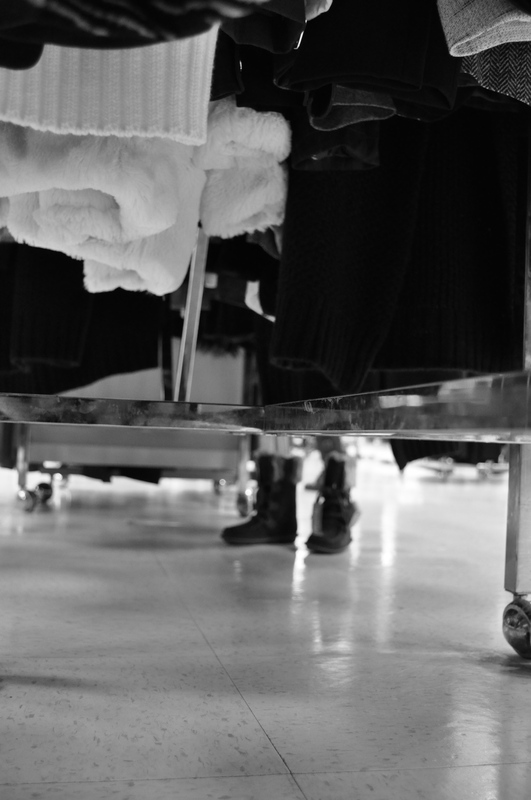 When I accompanied my mother shopping as a child, my siblings and I would always get lost in the aisles and play “hide and seek” underneath the clothing racks. To us, this game added a third dimension to the typical shopping experience, enabling us to hide in a soft, dark space and pass idle time while waiting for my mother to finish. The second photo illustrates something I think a child would be amazed by; with such enormous height and unique texture, the palm tree is a visual and tactile wonder. Looking back, I would have thought the palm tree was like the back of a stegasaurus – spiky and hard, dangerous to touch. As an adult, focusing my attention on such small details of everyday life is truly eye-opening and gratifying. Amanda: It’s so interesting to see how everybody had a similar vein in mind with this project, yet still expressed it differently in our photographs! I love that you decided to capture hiding under a rack for your first photograph and that you chose to incorporate a specific memory into it. I commend you on actually being able to GET the photo, because I’ve experienced first hand how difficult it is to get a shot without embarrassing yourself in front of strangers! The tiny feet sticking out at the end is perhaps the best part of the photo – it’s subtle and in the frame, but not screaming at you. I find that the first photo is much more successful than the second, and I think that’s because at first the photo confuses the eye. It takes a while to get adjusted, but in taking the time to think, you sink into the perspective a little bit more. 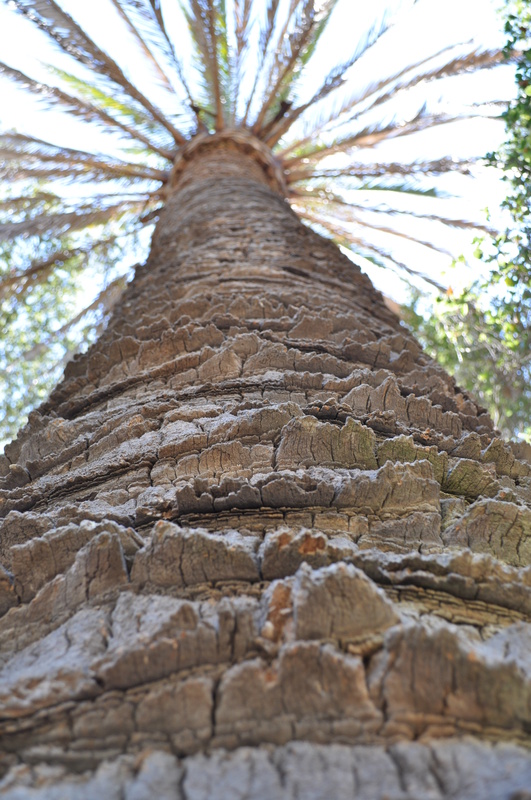 On the other hand, the palm tree – while truly amazing in texture – is easily identifiable as an adult. I knew instantly what it was, and therefore didn’t take the time to look through the eyes of the child. Perhaps a shot where the palm fronds aren’t visible at all could help to disassociate the image from prior images we already have! Still a beautiful photo though! Stephen: A great look in to the viewpoint of a child – It is great to see some similar styles going on – but with entirely different outcomes, and this is something that as a collective helps us develop our photography and writing even further. Your first photo is really fun! I can imagine myself hiding from my sister in the supermarket as my own mum is wandering round choring over the weekly shop. Its nice to remember the joys of daily life as a child – and helps us not forget how to enjoy the little things. Your second photo is a little weaker. I enjoy the textures and the motivation behind it – but it doesn’t quite feel as if I’m there, like the first photo does. Posted in #4 - A Child's Point of View, JacquelynTagged digital photography, from a childs perspective, hide and seek, jacquelyn, looking up, looking up and down, photo blog, photographer, photography, project 4, the photograph collective, tpcBookmark the permalink.